Hello! It's Teaser Time for My Favorite Things and we have a FULL week of fantastic new stamps and Die-namics to show you. AND we have some fun prizes for you too, so be sure to hop on over to the MFT Blog to see how you can win some MFT goodies this week. Time to get this party started! 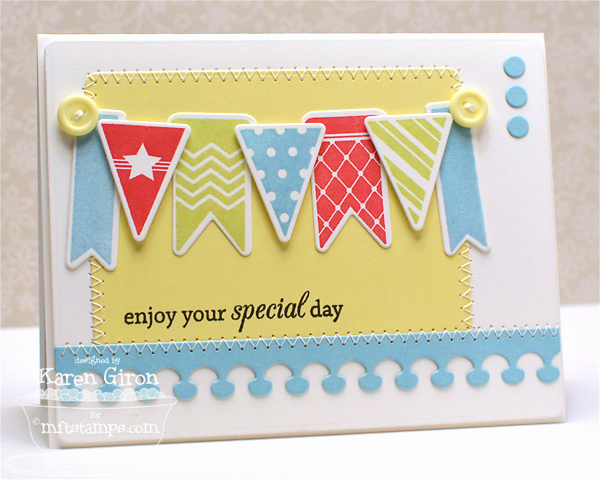 I'm starting off Teaser Week with this adorable set for Lisa Johnson Designs - Bitty Banners. I cut out the various banners with the coordinating LJD Bitty Banners Die-namics set in Smooth White Card Stock and then stamped the different patterns in Berrylicious, Electric Red, and Sour Apple Ink. I added two Banana Split Buttons on the ends of the banner strip. I used the new Blueprints 5 Die-namics to cut out the Banana Split panel, as well as the mushroom border and little dot trio in the corner. LOVE this new Blueprints set!! 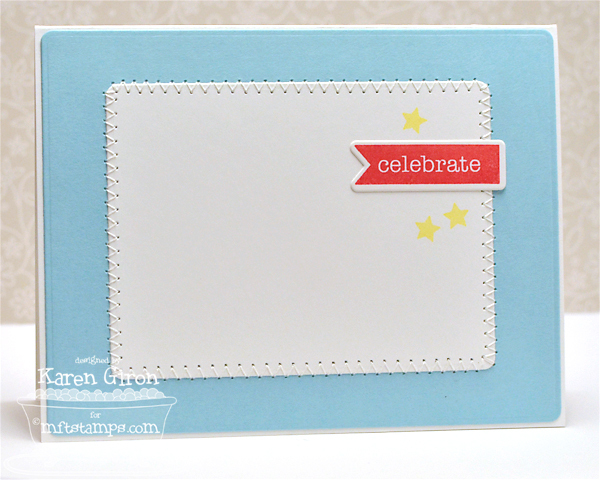 The sentiment is from another Lisa Johnson Designs set - Birthday Greetings, which I stamped in Black Licorice Ink. I used the Blueprints 5 Die-namics set again on the inside of my card to cut out the two main panels and then added another LJD Bitty Banners Die-namics with some scattered stars in Banana Split Ink. Wow! I Love, Love, love this card! This is so super cute, I love it. 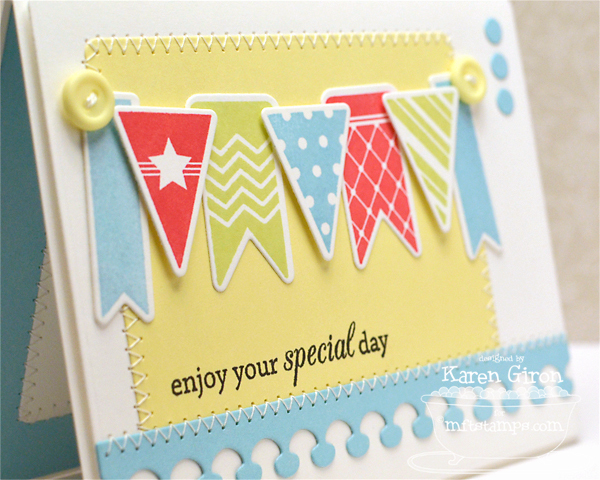 Banners make me smile...a happy card Karen! Karen, your card is adorable. Amazing as always. Party on paper! A day-brightening, smile-making piece of art! Love the colours, the banners, the sentiment: the works! Wonderful showcase of the new products. The 'wish list' is expanding!! LOVE. simple as that! great banners and colors and stitching! Love what you did with those Blueprints! The banana split backdrop is perfect! Cute color combo, Karen! (Try saying that three times fast!! LOL!) I really like how you incorporated the Blueprints! love these banners! Love your card. Beautiful card, Karen! I love also the stitching on your cards! Such a fun and sweet card! Your card is very pretty!! I love that sweet banner, Karen! Adorable card. Love the new banner set and Blueprints dies. love your banners. the colors are nice. Darling card. I love the dies from the Blueprints 5 set. The border is darling with these banner flags. Love your stitching, too. Thanks for sharing. Loving the Bitty Banners! This is fabulous!! This is such a fun card! There is so much you can do with those banners. I love the stitching!! What an ADORABLE card!! I just love this banner set!!! LOVE the colors you chose!! I could see this card as a new baby boy card. The bitty banners will be going on to my wish list. Great card. Amazing stitching as usual. So jealous. very colorful! and I love the stitching. Great color combo and cute card. Okay, I think I just squealed! This is too cute! Damn girl, can you make a card or what!